Getting back on track....this is one such recipe that I keep making from time to time and it is from Show me the curry.com. They have an amazing collection of recipes and I always love watching their cookery videos which are so easy to follow. I love this vegetable biryani as it is full of flavor and loaded with veggies. 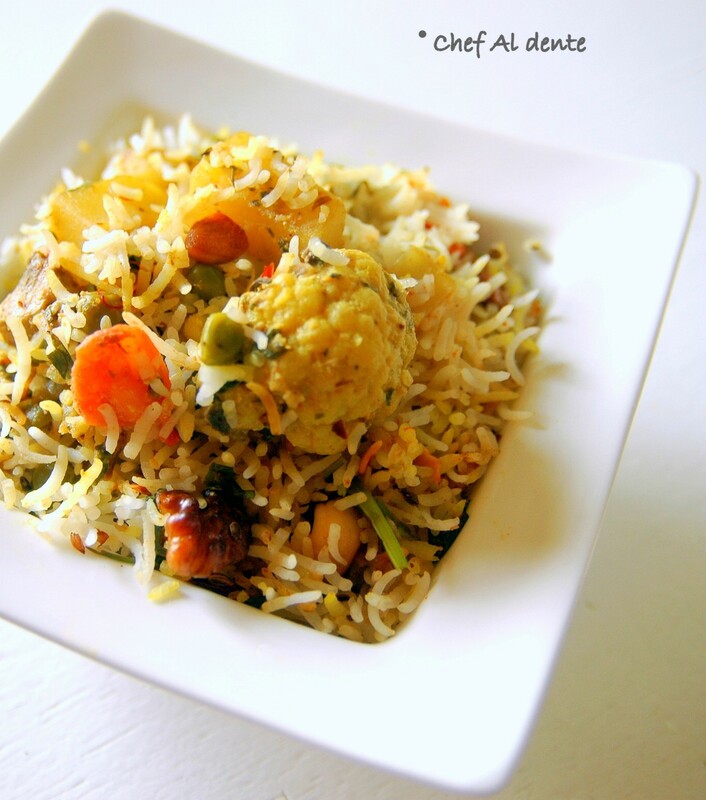 I think you would dig around to find more rice in this veggie dominating dish! I don't always make it with a lot of veggies or ingredients they mention in the recipe but it still tastes great. Yes, it is a bit time consuming but definitely easy and worth the effort. Check it out! For the rice: Bring 8 cups of water to a rolling boil and add the spices, oil, mint and salt. Cook it till the rice is three fourths done - roughly 5 mins. Drain in a colander and set aside. For the Biryani Masala: Dry roast the whole spices and let it cool for few minutes. Then roughly grind it. Need not be a fine powder. For Vegetable Mixture: In a bowl, combine ginger, garlic, coriander powder, turmeric powder, and salt. Add the veggies, green chilies, cilantro, chopped mint, dried fenugreek leaves. Mix well and allow to marinate while you work on the rest of the steps. In a non-stick pan, heat 3 tbsp oil on medium heat and fry the nuts until they are golden brown. Drain off all excess oil from and remove them onto a plate. Set aside. In the same oil, add cumin seeds and allow them to sizzle. Add Cinnamon Stick, Bay Leaf, Whole Cloves and Black Cardamom. Then add sliced onions and brown lightly. Add 1/4 tsp Turmeric Powder, 1 tbsp of ground Biryani Masala, salt and mix well. To this add the marinated vegetables and additional salt, mix thoroughly, cover and cook until the veggies are 3/4 cooked. Do not overcook. Stir occasionally to prevent burning. Switch off stove. Add tomatoes and lightly beaten yogurt and mix gently. To make Biryani: Coat bottom and sides of a baking dish with oil. Layer bottom of baking dish with 1/3 of cooked rice. Sprinkle 1 tsp of Biryani Masala on the rice. Layer 1/2 of the vegetable mixture over the rice. Layer another 1/3 cooked rice over the veggies and sprinkle 1 tsp Biryani Masala. Layer remaining vegetables. Layer remaining 1/3 cooked rice and sprinkle 1 tsp Biryani Masala. Drizzle saffron water over the rice and garnish with cilantro. Cover the baking dish with aluminium foil or a tight lid and cook for 45 minutes in oven. Serve hot with raita or curd and pickle. Heavenly. I like more veggies in my biryani than rice so just it for me. Nice biryani. Has the distinct homemade look - the no grease look! I like that! The rice has the perfect texture for a briyani, looks superb.. This is very good recipe...I will try it soon.